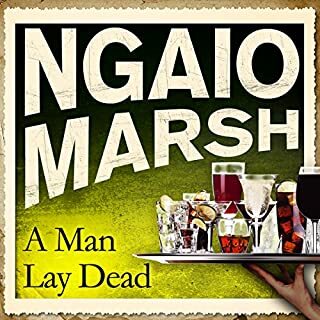 On a dark night, along a lonely country road, barrister Frank Amberley stops to help a young lady in distress and discovers a sports car with a corpse behind the wheel. The girl protests her innocence, and Amberley believes her - at least until he gets drawn into the mystery and the clues incriminating Shirley Brown begin to add up. 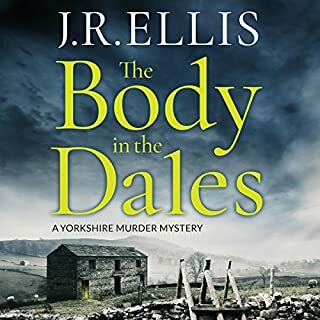 In an English country-house murder mystery with a twist, it's the butler who's the victim, every clue complicates the puzzle, and the bumbling police are well-meaning but completely baffled. Fortunately, in ferreting out a desperate killer, amateur sleuth Amberley is as brilliant as he is arrogant, but this time he's not sure he wants to know the truth. I have had this book in my library for almost a year, tried repeatedly to listen and failed miserably. In the end, I have heard the first chapter (really the beginning only) about six or seven times. The voice of the narrator is so hypnotic and slow that listening puts me to sleep in minutes. It does not matter what time of day it is, my intake of coffee or my desire to enjoy the book. It is a recorded knock out drug--both amazing and disappointing. I give up. I will have to read the book in print. I strongly suggest you listen to the sample before buying the book. Typical of Georgette Heyer, the story was great. The performance was an ordeal. The reader read the story at the speed a glacier migrates. This very slow speed resulted in weird pauses throught out the book and very S L O W, irritating progress. 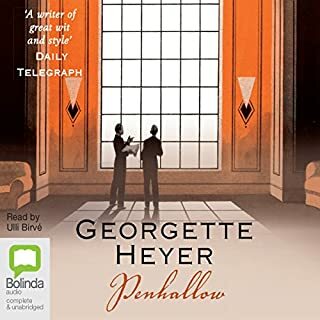 The slow delivery ruined Georgette Heyer's witty style. I finally put my I-pod on faster play mode to listen to this book. Once in a while, the performer would speed up to a more normal, natural speed. This meant that in faster play mode I missed some words and sentences. If there is another audio version of this book, get that one, not this one. 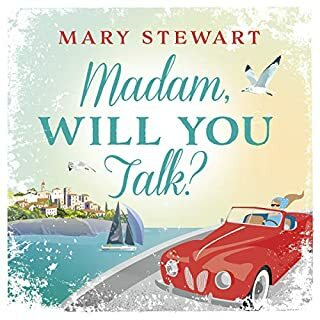 I'm not sure because the narrator's wooden flat dragging delivery spoiled the book for me, but I think there's supposed to be a good amount of witty repartee and funny characterizations in this book. Wish someone like Nadia May had been the narrator. I didn't finish it. 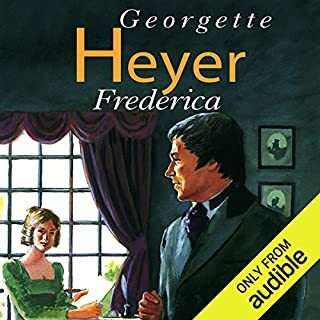 Would you be willing to try another book from Georgette Heyer? Why or why not? With a different narrator, I would be willing to try another book from this author. It was as if she believed the listener had very poor comprehension or wasn't a native English speaker. Really, flat, slow dull reading. 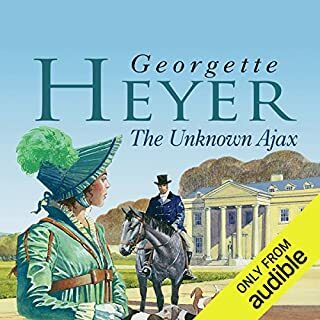 I really like Georgette Heyer, and frankly I have listened to and enjoyed a lot of her books in older audio additions created in the UK. The readers were delightful and I listened and relistened to the books with pleasure. 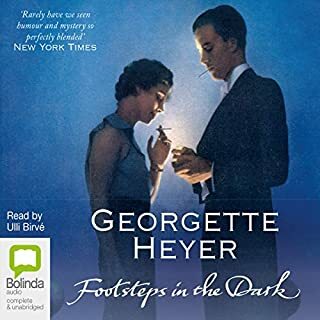 This book and Footprints in the Dark were the only two of her mysteries that I did not own in audio form so I was happy to try this book. Now I really wish I hadn't. One of the things I love about Heyer is the spritely dialog. Ulli Birvé for the most part reads it like it's a chore. She has a very monotonous tone and I really disloke the loss of period accents, class accents and British accents. Let's face it, people did not talk in 1933 Britain than they do now. You wouldn't know it from listening to this book. 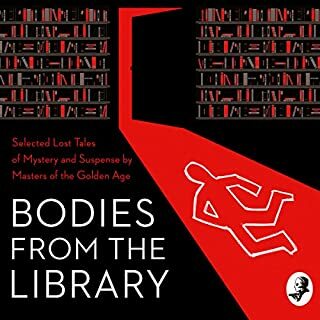 So the book is a bit of an action story with dead bodies, car chases and a host of eccentric characters, but you won't really appreciate if you listen to this audiobook. Instead you will probably fall alseep. Baaaaad narration is ruining this book! 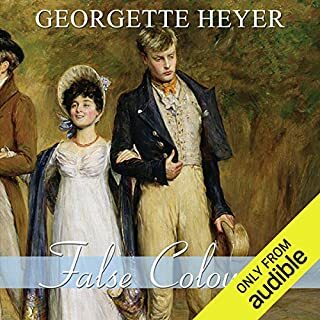 If you are a Georgette Heyer fan, skip these new ones until they are released with a different narrator. Ulli Birve is sleepwalking her way through - I am one hour in, and unless the plot can overcome her narration in the next hour, this one is going back. What is going on? Doesn't anybody at Audible listen to these productions before they are released? Not only is her voice a deadpan monotone, context and punctuation are blithely ignored as she stutters her way through the sentences. Example: "Fountain looked annoyed, and shook his head." The narration: "Fountain. Looked Annoyed. And shook his head." It's extremely distracting, and definitely not what Georgette Heyer's books deserve! People bag on the narrator, but I disagree. While at moments it was slowly dictated, the pace was aligned by character and moments. Pace of language is a reality of life and made this book real—pace of speech vs trying to manipulate sound of voice is a strong tactic. So if you are willing to let this book unwind at its pace, the story is awesome!! I wish there were an Amberley series!! If there is one, please don’t mock me, just link me? 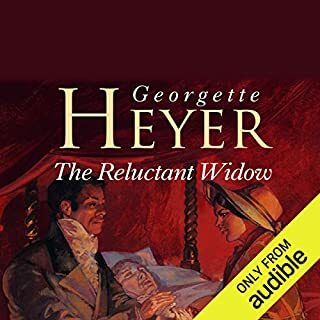 Georgette Heyer's books are known for their plentiful characters and authentic voices of the time and the witty dialogue. So a really strong narrator is needed who can clearly voice different characters. Also, this plot was rather more convoluted than other mysteries by Heyer, so that made it trickier. I hated the narrator. She sounded bovine and mournful the entire time. Who would you have cast as narrator instead of Ulli Birvé? Could you see Why Shoot a Butler? being made into a movie or a TV series? Who should the stars be? 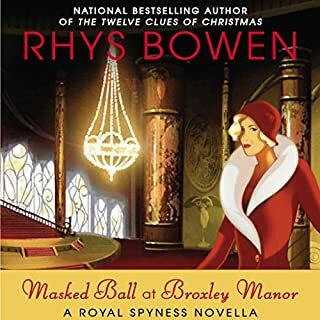 If you like Heyer, try her later mysteries like "Behold, Here's Poison" and "The Unfinished Clue"
A satisfactory murder mystery with some shocking anachronisms! Reader is (as always) too slow. I set the speed at 1.25 for most of the time. 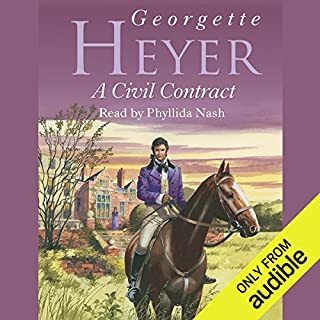 This was actually the first of Ms. Heyer’s mysteries and remains one of my favorites. It starts kinda slow then picks up the pace as it goes along. I really enjoy some of her characters— especially the aunt. It’s a fun read and nothing heavy. 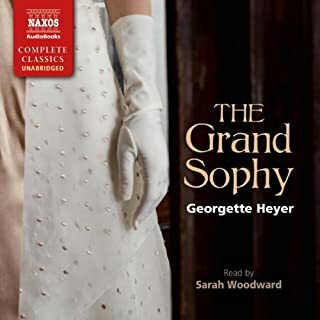 I've listened to 28 of the Georgette Heyer books written in the Georgian and Regency periods. Before reading my first Heyer work, I was not a fan of the Regency romance genre. However, I was hooked after listening to "Frederica" and promptly purchased more than 2 dozen more her audiobooks. But this book isn't nearly as good as Heyer's first work, "The Moth", written while in her teens. This story dragged out for hours with nothing of consequence going on. The characters are uninspiring and flat. The dialogue is boring. Halfway through the book, I still hadn't figured out what the whole thing was about. 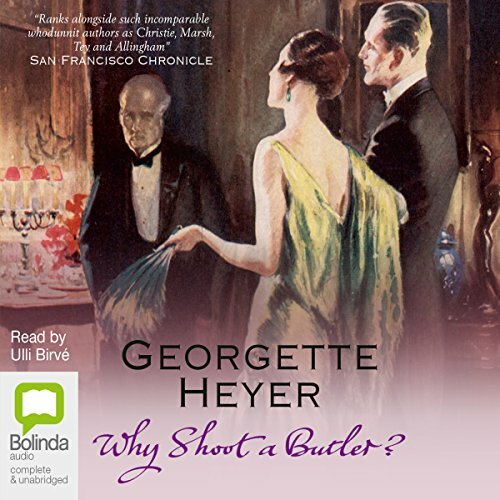 Maybe if I hadn't started with such great Heyer stories like "Behold", "Here's Poison", "Devil's Cub", "The Nonesuch", "Royal Escape", and "These Old Shades", I'd be more inclined to give "Why Shoot A Butler?" a higher rating. Something is missing here, i.e., the spark and genius that made the other Heyer books so enjoyable. This is a good story but, was spoilt by the narrator. The local police and residence of the English town all seem to have been born in Australia. The narration is very stilted. The narrator has no idea about punctuation, pausing in the middle of sentences etc. Nor does she know how to pronounce certain words. Data is pronounced darter and pince-nez she pronounced pin snares. 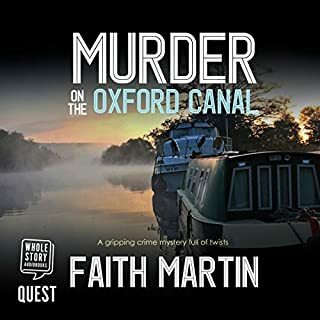 This was not a cheap audio book so I would have expected the narration to have been checked by someone before it was offered for sale. The narration really affected the pleasure of listening to this audio book. It was not relaxing to listen to just annoying. What would have made Why Shoot a Butler? better? 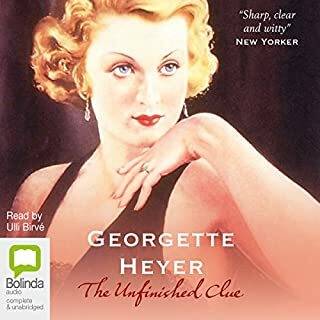 I may be biased in that I love Georgette Heyer's murder mysteries more than her period novels. However this woman read the novel as if she had never encountered English before. I have never *ever* come across reading out loud as bad as this - and I help out in primary schools listening to under 10s reading books. Please, do not leave her in a recording studio without her carers ever again. What was one of the most memorable moments of Why Shoot a Butler?? I gave up after an hour. I tried. I love the book so stuck with it as far as I could. I even resorted to a glass of wine after the first half hour but that didn't help either. Who might you have cast as narrator instead of Ulli Birvé? My cat would make a better job of it. The book is brilliant. The audio-book makes diabolical seem positively heavenly. I want my ears cleaned. 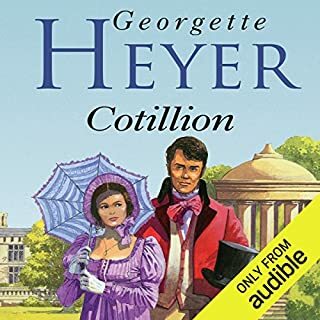 I agree with all the comments regarding the narration of the Heyer detective novels which completely spoils the enjoyment of the stories. There is little attempt at characterisation and frankly I have just given up even trying with them. I think they should all be re-issued with a different narrator. 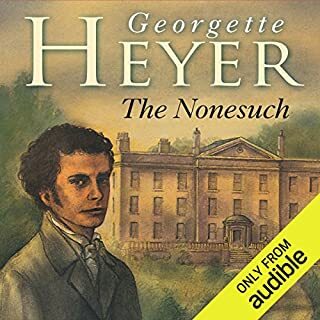 I prefer the historical novels anyway, having been a Heyer fan since my youth, and with very few exceptions the audio versions actually add to the enjoyment. A shame the same cannot be said for the detective novels. Ulie Birve' is a boring, stilted narrator who destroys any enjoyment of this extremely well written story. Her narration is slow and precise and does not keep up with the flow. Altogether a MOST disappointing listening experience. Poor Georgette must be turning in her grave!! 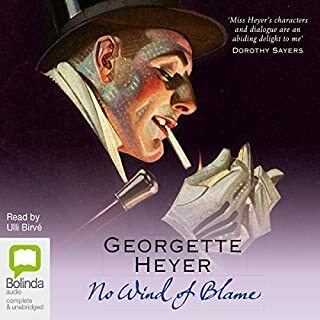 I love Georgette Heyer, but I simply can't listen to this reading of her detective fiction. Is there anyone out there willing to re-record them? Honestly, this version is worse than listening to an automated computer version. Don't make the mistake of buying it and thinking the story will make up for it. It won't, however much you want it to. Sadly, all the detective fiction has the same narrator, so it's all off limits to me. Not one of Heyer's more entertaining murder mysteries (they usually are). Missing some of the snappy dialogue in others.